Maybe you think the upcoming remake of “The Magnificent Seven” is a cash-grab, which means you may not realize there already were three sequels made. 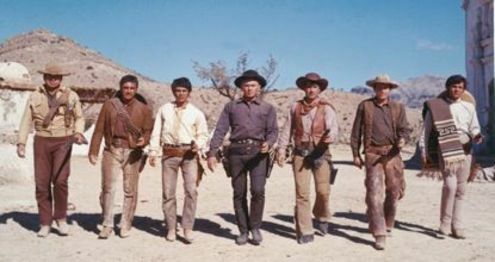 Made six years after the original, 1966’s “Return of the Magnificent Seven” might as well have been made 60 years after the original. Westerns were no longer the rage in the States, so the sequel was filmed in Spain, which is why it has more of a spaghetti western feel to it. 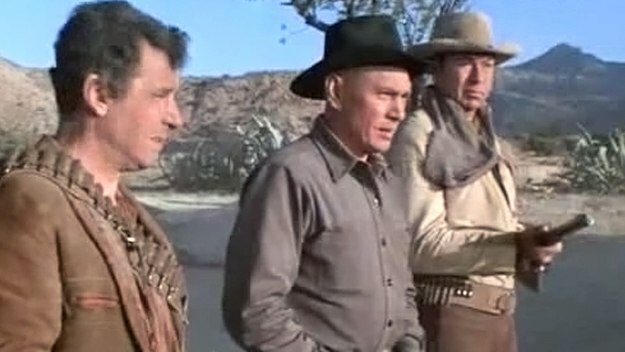 The only returning actor, Yul Brynner, leads the cast with two new actors portraying characters who survived the original. Composer Elmer Bernstein returned as well and earned an Oscar nomination for his work here. While it doesn’t have the same depth or charm as the original, the first movie is still a good one. The sequel picks up ten years after the conclusion of the first movie. Chico (Julian Mateos replacing Horst Buchholz) is still living in the village he helped save with his wife Petra (Elisa Montes) and son. But one day, a gang of bandits ride into the village and basically kidnap every male and march them out into the desert. Petra goes for help, finding Chris (enter Brynner’s Chris Adams) in a nearby border town. 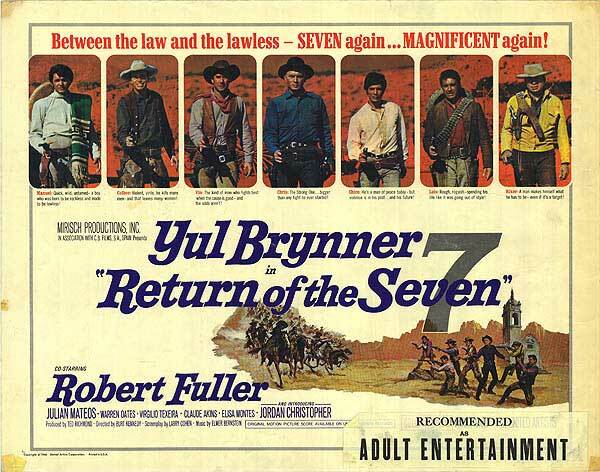 Assembling a new group of “seven”, with Vin (Robert Fuller, replacing Steve McQueen), Chris rides south to rescue Chico and the other men from the village. What they find is a small city being built in the middle of the desert, the workings of an eccentric rancher, Francisco Lorca (Emilio Fernandez). Lorca needs all these men to build the town and most importantly, a church, in honor of his two sons who were killed on the location during a recent uprising. Chris and the six bully Lorca out-of-the-way, but the Mexican rancher won’t go quietly, forcing the seven to hole up and try to defeat Lorca and all his gun hands. This new Magnificent Seven: with two more sequels to go, I’ll get this out-of-the-way now. You can’t cast a movie with the caliber of actors that were in the first one. Brynner is back, and we do get some background information on him, which is cool to find out about. McQueen was reportedly offered the part of Vin but chose not to reprise the role unfortunately. It’s an average western as is, but with him, it might’ve moved up a notch. Fuller is capable enough but doesn’t bring a ton of personality to the part. And in the upgrade department, Mateos makes a good Chico. For one, he’s actually Hispanic, not German like Buchholz. 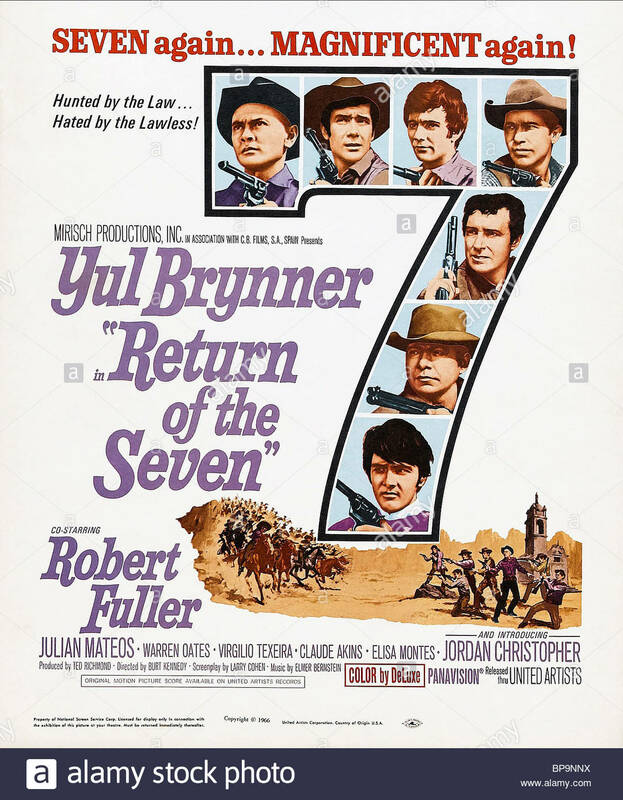 On to the new members of the seven, led by Warren Oates and Claude Akins, two great character actors ideally suited for key supporting roles here. Oates plays Colbee, a gunslinger with a wandering eye for the women, signing up with Chris when he hears about a village occupied solely by women. It’s a funny part, but one with some darkness to it as Colbee explains some of his background with Chris. Akins plays Frank, a gunman looking to get himself shot up for the guilt he holds from his past. Also joining the group are Virgilia Teixeira as Luis, a Mexican bandit Chris frees from jail, and Jordan Christopher as Manuel, a young Mexican boy inexperienced with guns looking for somewhere to belong. The Villain: Eli Wallach set the bar about as high as it could go with his part as Calvera in the first movie, so it would be difficult to live up to that role. 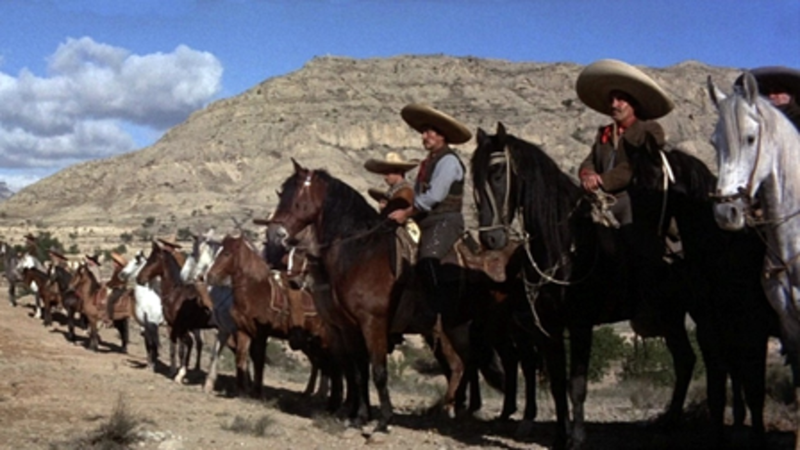 Fernandez (Mapache in “The Wild Bunch”) just isn’t as strong an opponent as Wallach, and that’s with about five times the amount of gunmen with him. His back story is interesting, but it makes him seem like a weak old man, not an intimidating, half-crazy madman. Fernando Rey (“The French Connection”) has a small part as the wise village priest. “Return” is 33 minutes shorter than the first movie. The script seems thrown together in a rush job once the seven are assembled. Then, once the situation is laid out, it’s basically 35 minutes of siege fighting as Lorca and his men attack the seven in a half-built church. The action scenes are well put together, if a little ridiculous (especially the finale), but with little build-up they’re just kind of there. The same issues are there with Chris and Vin questioning what they’ve done all these years, surprisingly enough producing some emotional moments. Part of me wants to say that if this movie was just released on its own with no predecessor, it’d be a more highly regarded movie. But following in the rather large footsteps of the original, it would be almost impossible to match the enjoyment and excitement. “Return” is worthwhile and an entertaining western in spite of some flaws, but if you’re not expecting a classic going in you should be okay.